What is the best approach to show images on smartphones & tablets? To swipe or not to swipe? How about fluid videos? About a month ago I decided to heavily redesign my website. This little site has been my cutting-edge technologies playground for years but it was becoming outdated by some many ways. Mobile first. Mobile is unquestionably becoming the standard for content consuming - reading, browsing, looking. Even I find myself using my smartphone for reading the articles and using the laptop only for writing or creating content. Therefore the site needs to be at least as good on mobile, than on desktop, if not better. Responsive images, fluid videos One of the main topics is to show my photos, I want them to be responsive and give the best experience on any device. It’s not that hard, is it? YES IT IS. There are: carousels1, lightbox2-(clone3) galleries, fancy over animated galleries4, mobile friendly swipe galleries5, the one I did for myself gallery6, the other I borrowed into a WordPress plugin gallery7, the old-but-still-cool gallery8, even some 3D, real-life gallery mimicking ones9, and soo many more… How could anyone choose from these? And which one is giving the best user experience? I don’t have The One True Answer, I only have my answer: for mobile, go as static as possible. Remove the fuss, remove basically everything that could make the visitor miss an image. Swiping can be buggy, can be counter-intuitive. Full screen pop-up galleries, slideshows, carousels are all hiding the overview option and they require the user to rotate through all the images. They are also without the ability to quickly revisit one. (Why sliders and carousels are evil?10) and a brief explanation why you should never use them11 ) For mobile, thanks to the mostly vertical displays, you can simple place the images below each other and have vertical scrolling. But the desktop is still a different world. ( I’m not messing with the touch screen desktops yet, that still needs to evolve and show the actual usage patterns. ) Desktops have mouse which is a high precision tool compared to your finger. They are mostly horizontal compared to the vertical screen ration on the handhelds so if’d I want static images, I’d need to create horizontal sliding for the same experience making the landscapes full-screen size, and that is a bad idea12. Sticking to the original, thumbnails-and-preview layout it is then. The desktop version can stay fancy. 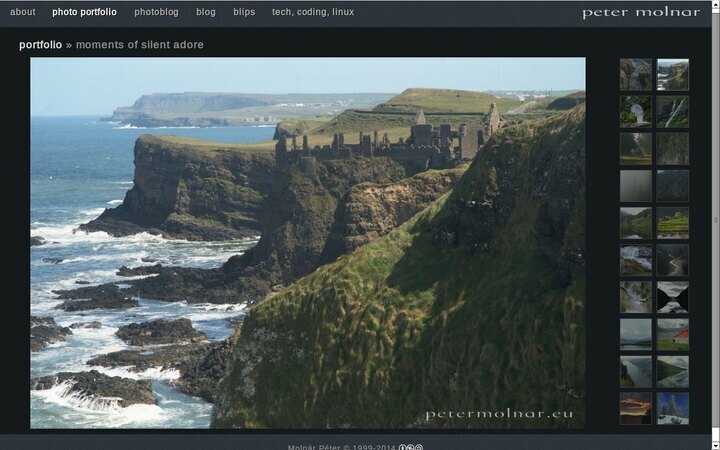 Until the actual picture set13 tag truly emerges, I need to stick to CSS3 media query based background changing14. Ugly as hell, but it’s at least scriptable and even saves bandwidth a little. Thankfully this topic is much easier due to the already present different resolutions on most of the video sites. The List Apart article Creating Intrinsic Ratios for Video15 made a clear point for presenting fluid videos on a page, and for WordPress, check out WordPress Canvas - Responsive Videos16 and use it without even touching code. Of course it might need some hacking and maximum width limiting if you want to avoid fullscreen videos on desktop, but it’s much easier than with the image galleries. But this is something you need to learn to live with. We’re using our mobile devices very differently than we used our desktops. Even the social activity shows a crazy difference on behalf of the mobiles. So let’s face it: we need different layout to have the same effect. The first two for traditional desktops, the second pair for retina desktops. But with 4K, there’s more to come, again.